How can I configure a specific key to scroll the homescreen? I don't think you can. I suppose you can map DPAD Left and DPAD Right if your keyboard does not already have cursor keys. However it won't be a one-press-to-change-homescreen solution. Never tried mapping page up and page down though. Probably won't work but could be wort trying. External Keyboard Helper is a really god app! I have a problem which may or may not be related to External Keyboard Helper? I have a Microsoft Wedge Keyboard which is working fine, but then my son accidentally activated some kind of "shortcut mode" to launch apps only by pressing for example the "M button" for launching Gmail, and "C button" for launching Contacts. I have not set up any Application shortcuts or Text strings. Which buttons did he press to active it? How do i deactive it, so i can use my keyboard again? Restart your device. On some Android versions it can get stuck in thinking that the "Meta/Windows" key is pressed down. Restarting the device solves the problem. I actually solved it, by parring the keyboard with my android phone, and then parring it back to my tablet. If the problem occurs again i will try to solved it by restarting my device. Love this app! It maximize the function of external keyboard on my android. In the list of remapped keys (second to last screenshot) why does it say "Shift" to the right of each remapped character? It shows the capslock mode for that key. See the explanation in the FAQ for more info on the different caps-lock modes. Is it possible to put control characters into the text strings? I would love to be able to send the sequence "shift-cursor-right ctrl-x cursor-left ctrl-V off a key - a really simple way to transpose two mistyped characters. But it doesn't look as if this would be possible. Not currently possible but it's on my "might happen" list. Is it possible to make a shortcut to an application using Ctrl key? For example, Gtrl-g for Goole. If I press Ctrl-g in Scancode input field, the program finally pick the ctrl scancode only. Not currently but making Ctrl+key a mappable option is on my "Might happen" list. I suppose if you are not using Ctrl for anything else you could check the option that threats left and right alt differently and also the "override special keys" option and then map one of the Alt-keys to the Ctrl key and then map application shortcuts to that key combination. I don't recommend this. Apps like Google Drive, Chrome, DroidEdit, TeamViewer, etc. use ctrl-key keyboard shortcuts. Drive uses them in the editor- for example ctrl-b for bold. 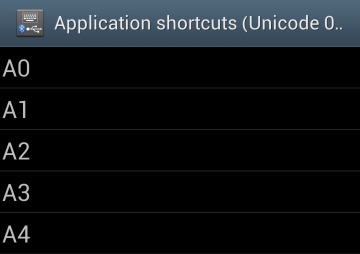 Chrome uses most of the same keyboard shortcuts as on Android. DroidEdit has configurable shortcuts. And TeamViewer will pass along almost any key combination you enter (if the Android system doesn't interrupt it). Also, in almost every app you can ctrl-a, ctrl-c, ctrl-x, and ctrl-v in a text field (to the effects you would probably expect). I have a Logitech blue tooth keyboard and a Samsung Note Pro12.2. The keyboard has a FN key to start email, browser and calendar, e.g., FN3, FN4, FN5. Only FN5 for the calendar works. How can I program the use of the FN key with 3 and 4 to open Email and Chrome? I tried the demo and it didn't work. I don't think it reads the FN scan code. Thanks. The FN key usually do not produce a scancode. Instead it often alters the scancode of another key. So one key can produce one scancode without FN and another with FN. If that is the case then you may be able to map the key with FN and without FN separately. 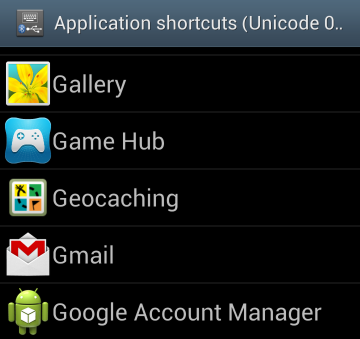 Hi, I add some shortcuts too launch applications but it does not seem to work with CyanogendMod 11 (Android 4.4.3). Do you know how I can make it works ? It was working with the stock ROM. 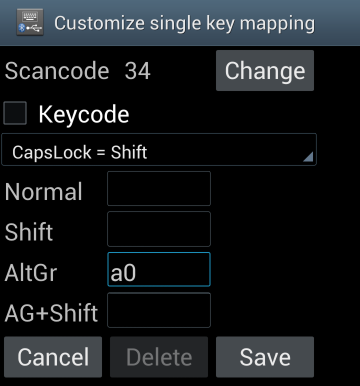 Can I remap a key to send "ALT+TAB" codes? No, I've tried that and it doesn't work. 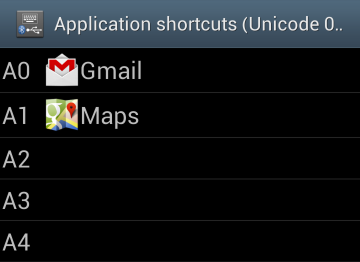 Seems Android picks that one up early in the input handling. Hi! I've a question, and I don't know if EKH is ths right app. I have a Galaxy Note 10.1, and bought a Verbatim bluetooth keyboard. The keys work great, but there some keys (for setting more or less bright, copy, cut, paste) that I can't make them work. Is there any way of assigning these keys to their "original" function? Maybe. It depends on if those keys sends normal scancodes or if you use dual scancodes as some keyboards use for "special keys". 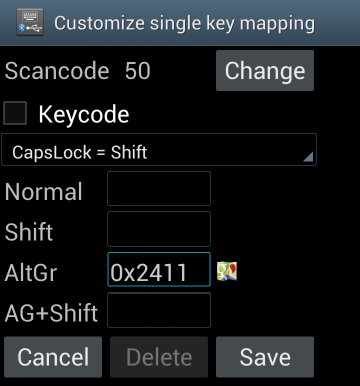 Try the demo version if unsure and what you are looking for is mostly the keycode mappings (se tutorial #2). I've added custom keycodes for brightness, cut, paste, copy and more. I really like the keyboard helper, but there is one thing I'm really missing, and that is a way to open new tabs in my Web browser with the keyboard. Can this be programmed in some way? I am using an application that uses Function Keys 1-12 and Shift+Function 1-12. I cannot send F11 or F12, nor any of the Shift+F1-12. How can I create Function Keys 11 & 12 and Shift F1-12? No problems with my SM-T520. I simply changed by default input method to EKH Keyboard by switching to virtual keyboard and then to EKH keyboard. 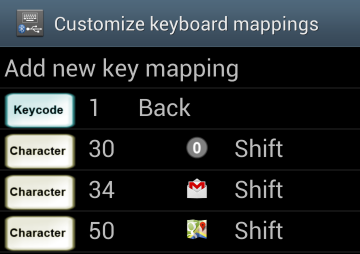 Sure I couldn't uncheck Samsung Keyboard, but I have no annoying pop ups and I can use my custom shortcuts hassle-free. This app works great. But for some reason when I press ctrl-[, it doesn't send an Escape signal, instead it types '['. Is there a way to enable the normal behavior for ctrl-[? I tried using AB Shutter 3 as "Enter" or "Select" key. Not working! Any solution? I want to try it with Google Cardboard App. hello. ı dıd the remappıng but nothıng works as ı dıd. what ıs the problem? Asking For Sony bravia android tv. how active is this blogg? Is the app author available anywhere? my mobile enable to open camera from lock screen but my AB remote shutter does not open the camera when on lock screen, however the remote does wake up the screen. do you have any work around so I can open the camera from lock screen? Love this app and have been using as my daily driver since 2014. Just moved to Android Pie and I can't get this to work. Any advice?